Saturday, March 28th, 2015, 2pm-??? The Cats are pretty much moving on to other adventures in our lives so this is our Grand Finale. Come celebrate ten years of The Copycats with us! Special guests Planet D. Musicians, bring your instruments! Here's a flyer. Saturday, September 25th, 2010, 5pm-??? This is the last "official" annual party at the farm. It's the same day as, and right next to, the Webster Fall Festival. BYOB. Hanging out starts at 1pm, music starts at 5pm. Be there or be square! Saturday, September 26th, 2009, 5pm-??? This is the annual party at the farm. It's the same day as, and right next to, the Webster Fall Festival. BYOB. Hanging out starts at noon, music starts at 5pm. Be there or be square! A three-day (Friday the 24th through Sunday the 26th) music festival with a Woodstock atmosphere and all genres of music. Admission information here; camping information here or via phone at 734-260-9009. Our appearance is brought to you by Ufer & Co. Insurance and Afternoon Delight Cafe. Join us in Corktown after the Detroit St. Patrick's parade. Rescheduled and relocated! The annual BandJam hosted by Big Pinky. Saturday, January 17th, 2009, 7pm-??? Saturday, December 20th, 2008, 8:00pm-??? This is the first Copycats gig at the legendary location of Bill and Aaron's first meeting with Paula! Friday, November 7th, 2008, 8pm-??? Saturday, September 27th, 2008, 5pm-??? Saturday, August 9th, 2008, 1pm-??? Monday, June 30th, 2008, 6pm-??? Cruising the Grand: while you listen to us, check out some classic cars (and bring your own if you have one). The farewell gig for live music at Creekside -- help us take it out with a bang. Downstairs at the Creekside Grill and Bar. The annual Multi-Media Extravaganza features a wide variety of performers and other entertainment. Here's the flyer [PDF]. Parts of this performance will be broadcast on WPON-AM 1460! Get ready for St. Patrick's Day! 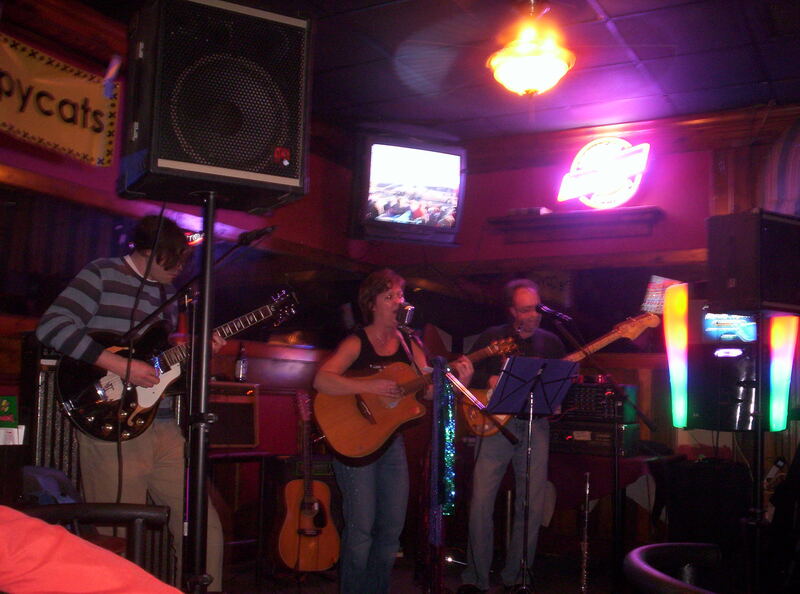 Our first "Jackson Roadhouse" gig (downstairs at the Creekside). Video here! Friday, January 25th, 2008, 8:30pm-??? At the Farmington Carriage House. This lodge's 55th anniversary party. Saturday, December 15th, 2007, 8:30pm-??? Join us for some Christmas songs! Friday, November 30th, 2007, 8:30pm-??? Friday, November 16th, 2007, 8:30pm-??? This show features a wide variety of performers. The Copycats are performing for fifteen minutes around 9ish. Here's the flyer [PDF]. Saturday, September 22nd, 2007, 5pm-??? This is the annual party at the farm. The Copycats as a whole won't be playing (Bill will be at his Dad's wedding), but Paula and Aaron will be there for a little jamming with friends. This is the same day as, and right next to, the Webster Fall Festival. BYOB. Hanging out starts at noon, music starts at 5pm. Be there or be square! Saturday, September 8th, 2007, 3pm-??? Saturday, July 28th, 2007, 8pm-??? Our first time playing outside on the deck. Saturday, September 23rd, 2006, 5pm-??? The same day as, and right next to, the Webster Fall Festival. Saturday, September 16th, 2006, 4pm-??? Saturday, April 15th, 2006, 2pm-??? Kalen Percha drummed for us at this and the other Cavern Club gigs. Pictures from this show taken by Tammee, Kalen's mom.